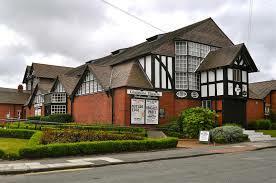 The Gladstone Theatre in Wirral’s Port Sunlight is one of the most historic buildings in this beautiful garden village. Originally built as the Lever Brothers staff dining hall, it was converted into a theatre in the 1950’s. Recent major improvements to audenice and performers’ facilities have provided a theatre experience second to none. With 430 seats and a full programme of high class amateur and professional shows, a friendly welcome awaits all who visit.